Today is the birthday (1126) of ʾAbū l-Walīd Muḥammad Ibn ʾAḥmad Ibn Rushd‎ (أبو الوليد محمد ابن احمد ابن رشد‎), commonly known as Ibn Rushd (ابن رشد‎‎) or by his Latinized name Averroës, an Al-Andalus Muslim polymath, a master of Aristotelian philosophy, Islamic philosophy, Islamic theology, Maliki law and jurisprudence, logic, psychology, politics, Andalusian classical music theory, and the sciences of medicine, astronomy, geography, mathematics, physics, and celestial mechanics. 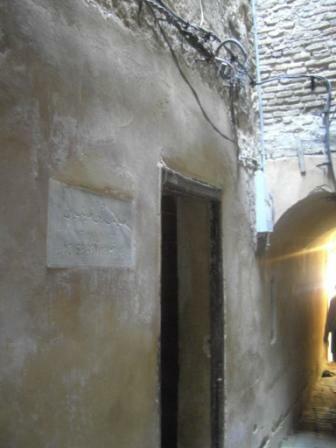 Averroës was born in Córdoba, Al Andalus, present-day Spain, and died in Marrakesh, present-day Morocco. He was interred in his family tomb at Córdoba. Averroës was a defender of Aristotelian philosophy against Ash’ari theologians led by Al-Ghazali. Averroës’ philosophy was considered controversial in Muslim circles because Aristotle’s rationalism conflicted with faith-based Islam. Averroës had a greater impact on Western European circles and he has been described as the “founding father of secular thought in Western Europe.” The detailed commentaries on Aristotle earned Averroës the title “The Commentator” in Europe. 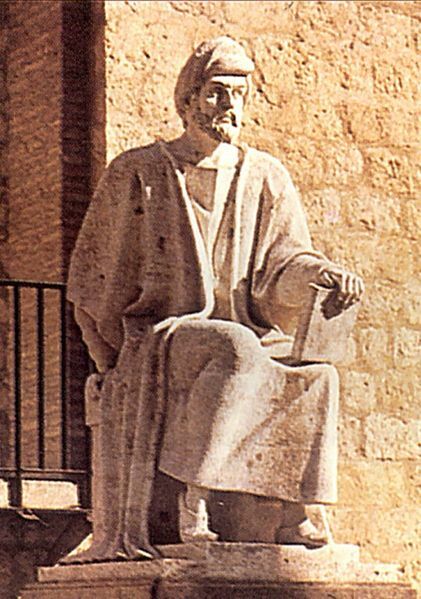 Latin translations of Averroës’ work led the way to the popularization of Aristotle and were responsible for the development of scholasticism in medieval Europe. Averroës was born in Córdoba to a family with a long and well-respected tradition of legal and public service. 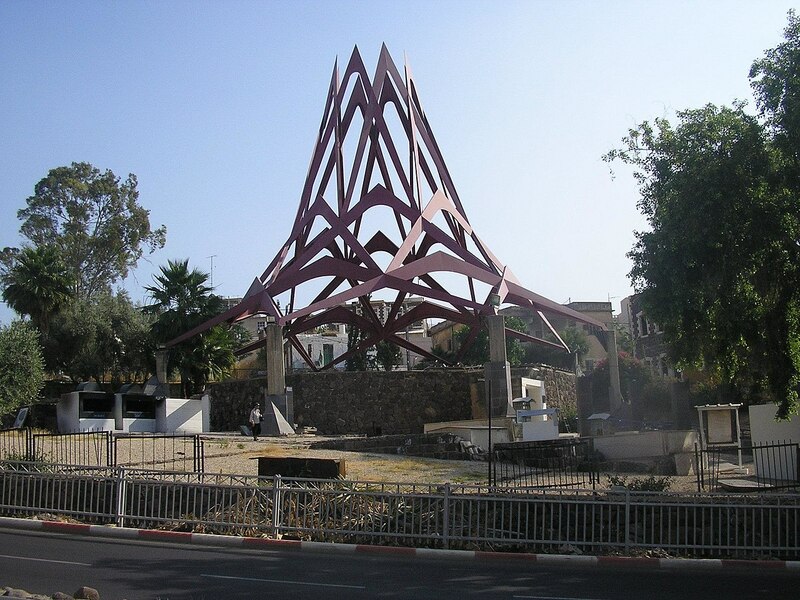 His grandfather Abu Al-Walid Muhammad (d. 1126) was chief judge of Córdoba under the Almoravids. His father, Abu Al-Qasim Ahmad, held the same position until the Almoravids were replaced by the Almohads in 1146. However, while the thought of his mentors Ibn Tufail and Ibn Bajjah were mystic to a degree, the thought of Averroës was purely rationalist. Together, the three are considered the greatest Andalusian philosophers. Averroës devoted the next 30 years to his philosophical writings. In 1160, Averroës was made Qadi (judge) of Seville and he served in many court appointments in Seville, Cordoba, and Morocco during his career. Some time during the reign of Yaqub al-Mansur, Averroës’ political career was abruptly ended and he faced severe criticism from the Fuqaha (Islamic jurists) of the time. And that is the same way he would mention another king of some other people or land, as it is frequently done by writers, but he omitted that those working for the service of the king should glorify him and observe the usual protocol. This was why they held a grudge against him [Averroës] but initially, they did not show it and in reality, Abu al-Walid wrote that inadvertently.Then a number of his enemies in Cordoba, who were jealous of him and were competing with him both in knowledge and nobility, went to Yaqub al-Mansur with excerpts of Abu Walid’s work on some old philosophers which were in his own handwriting. They took one phrase out of context that said: “and it was shown that Venus is one of the Gods” and presented it to the king who then summoned the chiefs and noblemen of Córdoba and said to Abu al-Walid in front of them “Is this your handwriting?” Abu al-Walid then denied and the king said “May God curse the one who wrote this” and ordered that Abu al-Walid be exiled and all the philosophy books to be gathered and burned. And I saw, when I was in Fes, these books being carried on horses in great quantities and burned. Averroës was not reinstated until shortly before his death in 1198. Averroës’s works total 20,000 pages covering a variety of different subjects, including early Islamic philosophy, logic in Islamic philosophy, Islamic medicine, mathematics, astronomy, Arabic grammar, Islamic theology, Sharia (Islamic law), and Fiqh (Islamic jurisprudence). His most important works deal with Islamic and Aristotelian philosophy, medicine, and Fiqh. He wrote at least 80 original works, which included 28 works on philosophy, 20 on medicine, 8 on law, 5 on theology, and 4 on grammar, in addition to his commentaries on most of Aristotle’s works and his commentary on Plato’s The Republic. Averroës commentaries on Aristotle were the foundation for the revival of interest in Aristotle in the 12th and 13th centuries in Europe. He wrote short commentaries on Aristotle’s work in logic, physics, and psychology, and longer commentaries provided an in-depth, line by line analysis of Aristotle’s Posterior Analytics, De Anima, Physics, De Caelo, and the Metaphysics. His most important original philosophical work was The Incoherence of the Incoherence (Tahafut al-tahafut), in which he defended Aristotelian philosophy against al-Ghazali’s claims in The Incoherence of the Philosophers (Tahafut al-falasifa). Averroës is also a highly regarded legal scholar of the Maliki school. Perhaps his best-known work in this field is Bidāyat al-Mujtahid wa Nihāyat al-Muqtaṣid ( بداية المجتهد و نهاية المقتصد), a textbook of Maliki doctrine in a comparative framework. 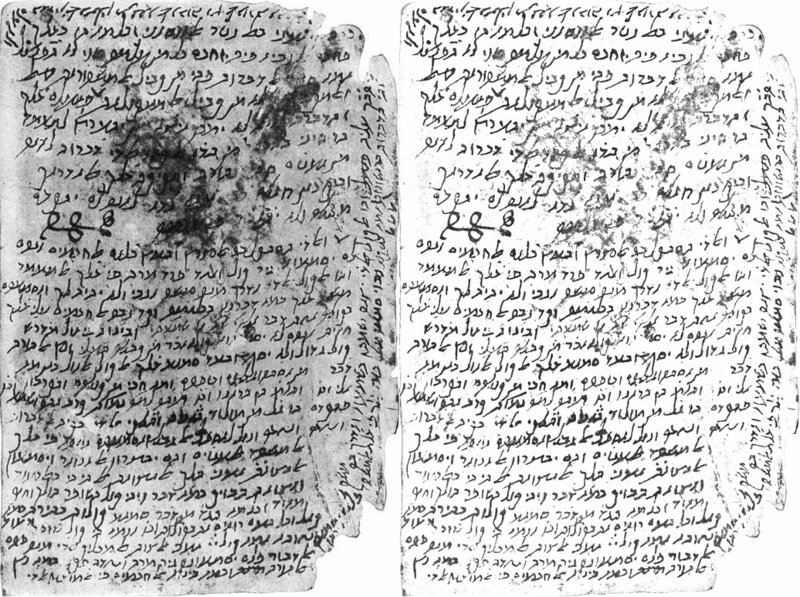 Jacob Anatoli translated several of the works of Averroës from Arabic into Hebrew in the 13th century. Many of them were later translated from Hebrew into Latin by Jacob Mantino and Abraham de Balmes. Other works were translated directly from Arabic into Latin by Michael Scot. Many of his works in logic and metaphysics have been permanently lost, while others, including some of the longer Aristotelian commentaries, have only survived in Latin or Hebrew translation, not in the original Arabic. The fullest version of his works is in Latin, and forms part of the multi-volume Juntine edition of Aristotle published in Venice 1562-1574. Averroës wrote a medical encyclopedia called Kulliyat (“Generalities”, that is, general medicine), known in its Latin translation as Colliget. He also made a compilation of the works of Galen, and wrote a commentary on the Canon of Medicine (Qanun fi ‘t-tibb) of Avicenna (Ibn Sina) (980-1037). Averroës wrote three books on physics namely: Short Commentary on the Physics, Middle Commentary on the Physics and Long Commentary on the Physics. He defined and measured force as “the rate at which work is done in changing the kinetic condition of a material body” and correctly argued “that the effect and measure of force is change in the kinetic condition of a materially resistant mass.” He took a particular and keen interest in the understanding of “motor force.” Averroës also developed the notion that bodies have a (non-gravitational) inherent resistance to motion into physics. This idea in particular was adopted by Thomas Aquinas and subsequently by Johannes Kepler, who referred to this resistance by the Latin term “inertia” (inaction). In Optics Averroës followed Alhazen’s incorrect explanation that a rainbow is due to reflection, not refraction. In astronomy, Averroës argued for a strictly concentric model of the universe, and provided explanations for sunspots and the occasional opaque colors of the moon. Following Plato, Averroës accepted the principle of women’s equality. They should be educated and allowed to serve in the military; the best among them should be philosophers or rulers. However, he also accepted Plato’s harsher social policies such as the censorship of literature. He uses examples from Arab history to illustrate Plato’s notion of just and degenerate political orders. His most important original philosophical work was The Incoherence of The Incoherence (Tahafut al-tahafut), in which he defended Aristotelian philosophy against al-Ghazali’s claims in The Incoherence of the Philosophers (Tahafut al-falasifa). Al-Ghazali argued that Aristotelianism, especially as presented in the writings of Avicenna, was self-contradictory and an affront to the teachings of Islam. 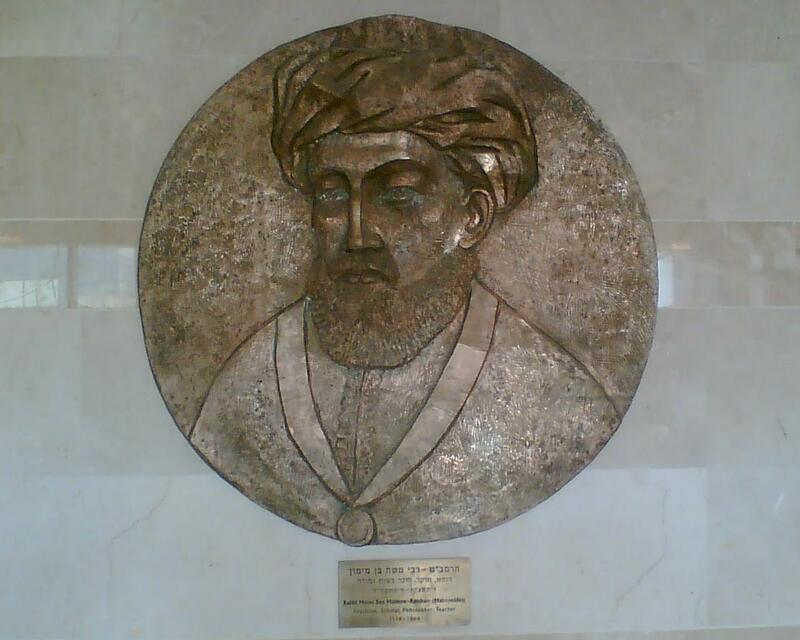 Averroës’ rebuttal was two-pronged: he contended both that al-Ghazali’s arguments were mistaken and that, in any case, the system of Avicenna was a distortion of genuine Aristotelianism so that al-Ghazali was aiming at the wrong target. His other major works are the Fasl al-Maqal, which argued for the legality of philosophical investigation under Islamic law, and the Kitab al-Kashf, which argued against the proofs of Islam advanced by the Ash’arite school and discussed what proofs, on the popular level, should be used instead. 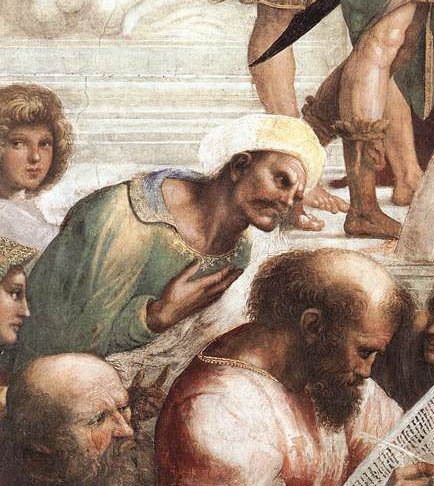 Averroës tried to reconcile Aristotle’s rationalist system of thought with Islam. He argued that there is no conflict between religion and philosophy, rather, they are different ways of reaching the same truth. He believed in the eternity of the universe. He also held that the soul is divided into two parts, one individual and one divine; while the individual soul is not eternal, all humans at the basic level share one and the same divine soul. Averroës asserted there were two kinds of knowledge of truth. The first is the knowledge of truth derived from religion. Being based in faith, knowledge via religion could not be tested, nor did it require training to understand. The second knowledge of truth is philosophy, which was reserved for an elite few who had the intellectual capacity to undertake its study. 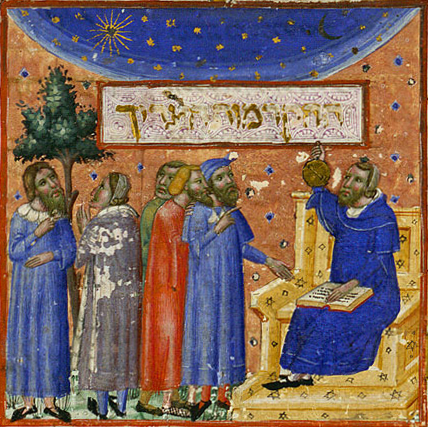 Many people in the contemporary world are aware that the contribution of Islamic scholars to astronomy and mathematics was profound in the Middle Ages, and some are aware that many works of Greek and Latin philosophy would not have survived were they not preserved in that period in the Islamic world. Many fewer are aware of the major contribution that Averroës made in re-introducing Western Europe to its own philosophical traditions, slowly making incursions into what had hitherto been a strictly faith based philosophy. Few Westerners today understand the difference between the Islamic and Christian worlds in the Middle Ages. For example, in the 10th century, when only about 40,000 people lived in Paris largely in their own filth, the Andalusian city of Córdoba, where Averroës was born, had a population of half a million, and had lighted streets, libraries with hundreds of thousands of volumes, 700 mosques and 900 public baths. The homes of the wealthy had fountains, plumbing, and running water. Their cooking was magnificent, and traces of it are still to be found in contemporary Andalusian cuisine. This included lamb meatballs, a spicy sausage called mirgas, fried fish (still common), and a kind of cheese cake today called almojabana. 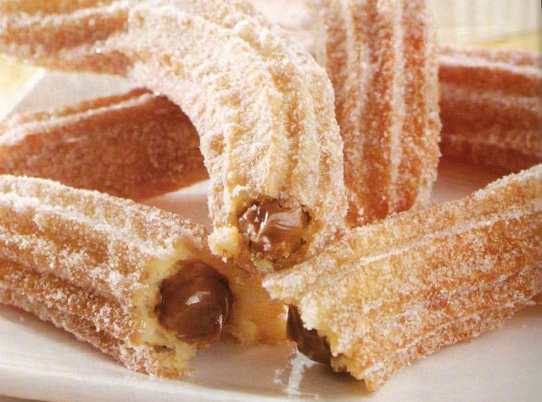 Another survivor in the Spanish world today is the churro, a cylindrical fried pastry which is now sprinkled with powdered sugar rather than, as in the old days, when they were dipped in boiling honey. In Argentina they are filled with dulce de leche. Yum. The grand cuisine of Medieval Al-Andalus is little known these days. 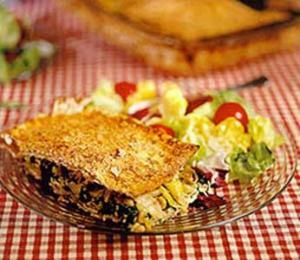 Want to try this royal recipe taken from a 13th century cookbook? One takes a fat young sheep, skinned and cleaned. It is opened between the two muscles and till that is in its stomach is carefully removed, In its interior one puts a stuffed goose and in the goose’s belly a stuffed hen, and in the hen’s belly a stuffed young pigeon, and in the pigeon’s belly a stuffed thrush and in the thrush s belly another stuffed or fried bird, all of this stuffed and sprinkled with the sauce described for stuffed dishes. The opening is sewn together, the sheep is put in the hot clay oven, or tannur, and it is left until done and crisp on the outside. It is sprinkled with more sauce, and then put in the cavity of a calf which has already been prepared and cleaned. The calf is then stitched together and put in the hot tannur, and left till it is done and crisp on the outside. Then it is taken out and presented. The preparation of buraniya, attributed to Buran, wife of the Abbasid caliph al-Ma’mun, of whom it is said that she was the first to invent this dish. One takes a fat young sheep and puts it in the pot with salt, pepper, dried coriander, a little bit of cumin, saffron and oil. The pot is set on a moderately hot fire; a tablespoonful of soaked almori and two of vinegar are added. It is cooked till half done, then taken off and grilled eggplant is added. One adds a layer of meat, and another of grilled eggplant. Then prepared meatballs are added, and chopped almonds; all is done with a lot of saffron. Then it is thickened with whipped eggs, with lavender or cinnamon or saffron, and crowned with egg yolks. Then it is put in the oven and left till the sauce has dried and it is blended and the fat is left. It is then taken out and put on embers and left a while. Then it is served. Almori was a very common ingredient. It consisted of salt, honey, raisins, pine nuts, almonds, hazel nuts, and possibly some flour, all pounded into a paste which was then allowed to harden in the sun. As needed, pieces were broken off, soaked, and added to the ingredients of a dish. Here is a modern version of Buraniya, still popular in the Middle East. Sauté the onions in about 2 tablespoons of oil until soft and golden. Add the garlic and the meat and brown it well. Add the tomatoes and salt, pepper, lemon juice, cinnamon, and allspice. Cover with water, stir well, and bring to a boil. Simmer gently, covered, for about 1 ½ hours, until the meat is very tender, adding water to keep the meat covered. Cut the eggplants and red bell peppers into ½ inch thick slices and brush generously with oil. Cook under the broiler or (best) over charcoal, turning several times until lightly colored. Add to the stew. Simmer, covered, for ½ hour, adding parsley towards the end. Serve with rice and flatbread. To be fully traditional you should serve everything on common platters and eat with the fingers of the right hand.